For those of you who have never heard of Fantasy Jewelry Box, you will be pleasantly surprised when you visit their website or YouTube Channel. Not only does Fantasy Jewelry Box have a HUGE selection of men's and women's jewelry, but all their pieces are also reasonably priced and well made. Amongst their great selection are pieces that have been inspired by some of the top celebrities and designers in the industry. According to their website, their "sterling silver jewelry collections primarily consists of high end genuine .925 Sterling Silver with high-quality cubic zirconia stones. [They] also proudly carry gold jewelry collections as well as fashion jewelry and costume jewelry for [their] more budget-friendly shoppers. [Their] cubic zirconia jewelry prices generally range from $10.00 to $500.00 so it is easy to see why [their] affordable diamond replica jewelry collections are so popular!" For my review, I allowed my sister-in-law to choose herself a birthday present. Between the two of us, we probably spent over an hour searching through all the beautiful choices. In the end she decided on the Sandra's 26" Wood, Glass, & Natural Stone Necklace Set. 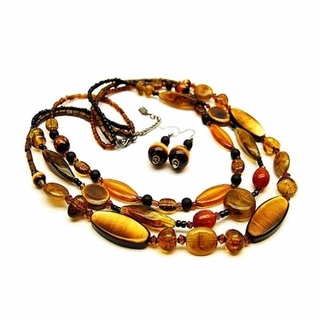 This set came with a Multi-layered necklace and matching earrings. "Multi-layered necklaces are such a fun addition to every jewelry collection. We love the bohemian inspired feel that this matching jewelry set gives off. Rich browns seem to melt into each other and wood, glass and stones complement each other perfectly. Wear with the matching earrings or alone" She hasn't seen it yet since her birthday is still a few weeks away, but I've tried it on and it looks amazing. I was a little worried that she may have picked something to long and bulky, but the layered look really works. Hopefully she will be as happy with her selection as I am when she sees it! The generous people from Fantasy Jewelry Box have graciously donated a two lovely pairs of earrings for our auction. They are gorgeous and I'd love to keep them for myself! :) Unfortunately, it was very difficult to get a good picture of them because my camera isn't very good. But below you will see a pair of simple cubic zirconium studs and a beautiful pair of CZ dangled earrings with an Olive green stone at the bottom. Join Fantasy Jewelry Box and Our Other Fabulous sponsors in supporting Relay For Life! Let's help the world Celebrate More Birthdays! The Online Silent Auction will run from May 20th - May 26th. All proceeds will go directly to the Relay For Life site and products will be shipped from our sponsors. I HOPE to see you there! Online Fashion is the treasure of glamor and beauty that harmonizes with the style and makes every woman totally new. Fashion for woman and their taste and preferences change and we consider this and accordingly change our style to leave a smile of happiness Our products are the best in online fashion and have a fleeting presence in fashion style and make a mark in belts, buckle, scarves, designer scarves, as well as in fashion Jewelry.